Subtropical Storm Melissa had been spinning in the Atlantic for a couple of days, slowly organizing itself into a not-quite-tropical-but-sorta-is system while to the east of Florida. Melissa has gradually improved its organization on satellite and is a relatively large system, with gale force (40 mile per hour) winds extending 300 miles from the center of the storm. With the cold front that crossed our region early on Monday now a good distance out into the Atlantic and pushing east, it will pull Melissa farther north and northeast, eventually transitioning the storm into a nontropical entity at some point in about two days. Before that transition takes place, it may briefly become tropical enough to lose the subtropical designation. 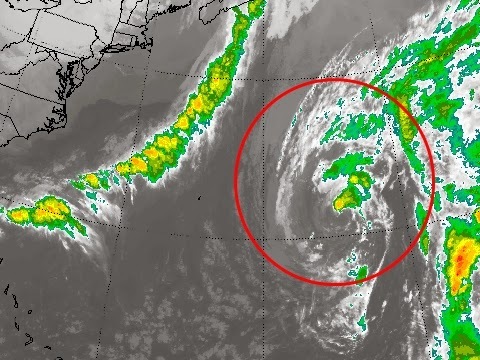 Once a year or so, a storm in the Atlantic earns the subtropical designation. Such storms typically are a mixture of warm core (tropical) and cold core (nontropical) in characteristics, larger in size and wind field than your typical tropical system, and one where the strongest winds aren't necessarily near the center. A storm's a storm but the structure of these storms isn't quite fully tropical, nor do these storms contain traditional weather fronts like a nor'easter does. Hence, Melissa ends up designated in the middle with the subtropical status. Regardless, this storm won't hit the US.